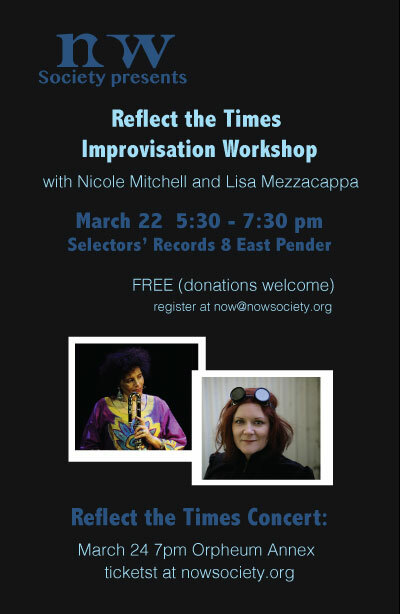 Join us for a FREE improvisation workshop with Nicole Mitchell and Lisa Mezzacappa! Bring your instrument, be ready to play at 5:30. The event is free, donations are welcome. Participation is limited to 20. Register by emailing now@nowsociety.org and by becoming a NOW member for 2018 (either at the first workshop, or here http://www.nowsociety.org/about/sponsorship). NOW workshops are open to creative minds of any level of ability, from all communities in inclusive and cooperative environments. NOW workshops are designed for creative individuals with varied experiences and offer safe spaces to explore instantaneous cooperative music. Lisa Mezzacappa is a San Francisco Bay Area-based bassist, bandleader, composer, curator and producer. An active collaborator in the Bay Area music community for more than a dozen years, she leads her own groups Bait & Switch, the Interlopers, Nightshade, Eartheaters and the Lisa Mezzacappa Trio, and co-leads the ensembles BODABODA, duo B., Cylinder, the Mezzacappa-Phillips Duo, and the Caribbean folk band Les Gwan Jupons. Lisa has released her music on the Clean Feed, NoBusiness, Leo, NotTwo, Evander, Odd Shaped Case and Edgetone record labels, and has recorded as a sideperson for the Tzadik, Kadima and Porto Franco labels. She collaborates frequently on cross-disciplinary projects in sound installation, film/video, sculpture and public music/art. As curator, she programs the annual JazzPOP concert seres at the UCLA Hammer Museum in Los Angeles, now in its 10th year; and a live cinema series, Mission Eye and Ear, at Artists' Television Access. She founded the Monday Makeout creative music series in the Mission District of San Francisco, and programs the Best Coast Jazz Composers series as a member of the artistic committee San Francisco's Center for New Music.